This past summer, I spent two months interning for Adobe in Munich, Germany. Throughout my time abroad, I not only experienced extraordinary personal growth through independent living, personal financing, and lone travels but professionally as well through challenging meetings and pressured deadlines. As a Business Development intern for Adobe, 70% of my work was centered around various business development projects, and the remaining 30% consisted of creating and maintaining client relationships with Eastern European firms. Being that this was my first internship in a corporate environment, I carried with me two concerns going into day one: would my work would be valued and how I would go about attaining respect from professionals within the firm. With a fresh shave, I don’t look a day over 15, so winning over the respect of my co-workers and feeling valued while delivering reports or presenting to superiors was undoubtably a factor in my mind. Fortunately, backed by the numerous Best Offices to Work For awards placed around the office, Adobe, Munich promoted a unique culture of inclusion and innovation that completely erased these initial assumptions. The young, tech environment provided an excellent opportunity for me to spread my wings and work within divisions of the office in which I envisioned myself providing the most value. Thanks to a flexible supervisor, I was able to work on various projects, across multiple horizontals, which translated into tangible and impactful results. Within the first few weeks, the work I produced created significant value to my assigned team, and with this, followed an unwavering level of respect from my co-workers. Over the course of the internship, I not only realized I had the ability to establish respect within a corporate office but also be seen as a valuable contribution to any project or team I was placed on. Now, lets take a step back. Reaching this point didn’t come without a few bumps along the way. On day one, I was placed within the office’s Sales team. The placement itself had me scratching my head for two reasons: my contract focused on general business development work rather than sales, and my specializations center around Accounting & Computer Science. How they came up with placing me within Sales baffled me. In spite of the disappointment, I pushed forward knowing that if I were to move to an alternative branch of Adobe, I’d first have to establish credibility and prove myself worthy of more dynamic projects. This was the inception of overcoming my assumptions that interns were often times regarded as a dead weight around the office. Over the course of the first couple of weeks, I worked hard to become exceptionally successful in attaining the sales metrics my supervisor held me accountable to. Each day, I made it a point to utilize every last minute either working towards the professional goals or networking with those in divisions I found interesting. Working on an alternative project consumed my every thought. Being able to do so would not only raise my interest in the internship itself but would eliminate any doubt in myself as an intern as well. The true turning point of the internship came when my supervisor sat me down for a candid conversation to survey my sentiment of the internship thus far. I knew this was an opportunity to state my mind, a true turning point in the internship. After much negotiating and communicating of my prior sales achievements, my supervisor finally complied to assigning me to an alternative project. For my remaining time at Adobe, I’d find myself within the office’s business development division working on a range of process improvement assignments. The Art of The Grind. Many people say they want good grades, a fulfilling career/internship, or a fruitful salary but few people are willing to put in the work necessary to achieve their goals. The difference between those who live their dreams and those who keep them as “nice thoughts” is how much work you are willing to put in. For me, I knew that if I were to be seen as a valuable contribution to Adobe, I’d have to first work hard to prove I was capable of complex, high-value assignments. In the end, the early mornings and late night paid off. Defy Stereotypes. Interns are highly unmotivated kids who expect and deserve nothing more than mundane, unremarkable tasks. Sales professionals are sleazy scammers pushing to find any way to take your money. After this internship, I’ve come to realize stereotypes are not dangerous because of their unflattering social labels but rather because they confine you to a limited range of personality types, goals, and responsibilities. Going forward in my professional career, I refuse to limit my concept of the potential impact I may have based on the title of my role, socioeconomic status, or any other defined label. Communication Skills Are Vital. From winning over the trust of a CMO leading to a $1.2 million deal, to convincing my boss why I deserve an alternative project, being about to convey your thoughts in a way that ends in getting what you want is a critical skill not only in the office but in life as whole. 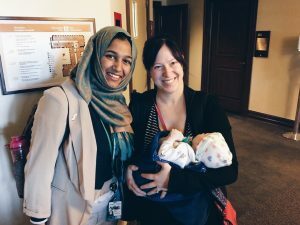 As an intern in the Canadian House of Commons for five weeks starting in mid-May and ending mid-June, I was assigned a specific member of parliament to work with; in my case, MP Christine Moore of the New Democratic Party. My day to day responsibilities included doing research on policies and bills that MP Moore was working on, reaching out to the stakeholders of those bills, taking detailed House notes while debates were in session, and attending weekly legislative meetings. In Ottawa, I learned many things about Canada’s parliamentary system, the impact American policies have on them, and met incredible people with careers that I could only dream of having in the future. But I also learned quite a lot about myself. As someone who was relatively new to her major in international studies and still trying to find her way, this internship solidified to me that not only did I hold a keen interest in the field but that I had a genuine passion for it. I loved getting up for work everyday, and staying late to finish an assignment wasn’t a burden when I truly enjoyed the work I was doing. There are three things that made my time in Ottawa an experience I will never forget: the people, the place, and the passion behind our work. As a visibly Muslim woman living in America, to say I was disconcerted by the previous presidential election would be an understatement. 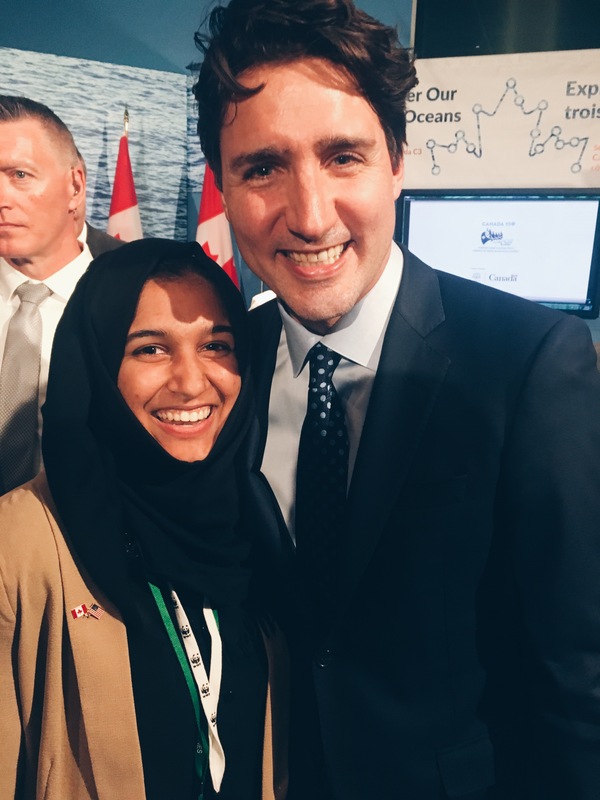 Going to Canada and working within their governing body definitely allowed for a much-needed breath of fresh air, but it also made me realize that every functioning part of every government (be it a citizen, a representative, or the Prime Minister himself) has their own issues with the current state of things. Utopia doesn’t exist neither here nor there; and sure, Canada’s policies, in comparison to the United States, might be much more aligned with the way I think, but that could change in a few years. And that’s what I love about my field – there’s always going to be room for improvement and nothing is for certain. But to be able to work towards betterment is something that I strive for in my personal and academic, and hopefully in the future, in my professional life. The people I met in the program and the people I worked with every day made each day in Ottawa that much more exciting. Like I mentioned earlier, I’m relatively new in my major, and this was the first time in my life I was surrounded by so many people who cared about the same things as me. I can genuinely say that I can see myself being friends with many of my fellow interns for the rest of my time at OSU, if not longer. My coworkers and other professionals I met made me realize that success in my field is not far-fetched and that there’s so many opportunities for growth and realization of my goals in the future. Finally, the city of Ottawa and the beautiful architecture of the parliamentary buildings around me inspired me to learn about the history of the city, and reminded me of the same feeling of possibility and productivity I get when I’m in my own capital city of DC. 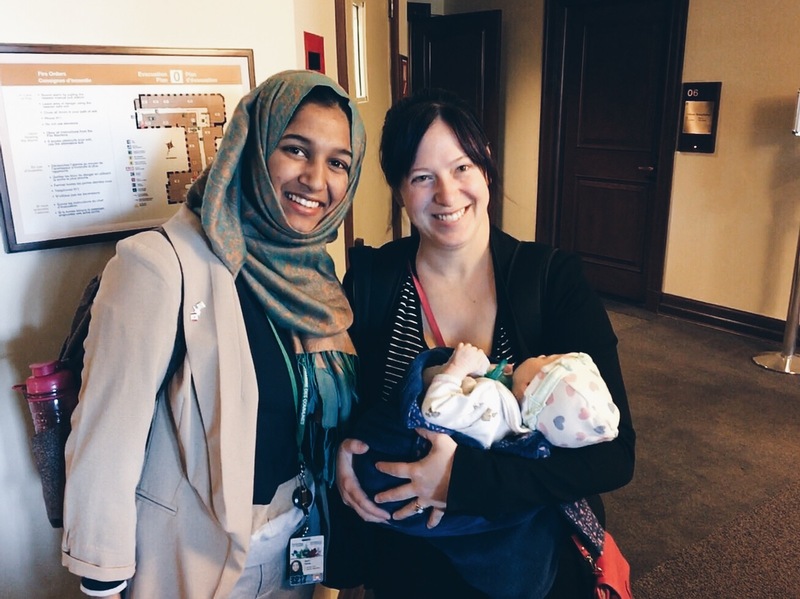 Everyday in my office, we’d have Question Period (a session where members of parliament can ask other members or the PM questions about how representative of their constituents they really are) streaming, and I loved knowing that, if I wanted to, I could attend the session myself only a few doors over. I fell in love with this accessibility and transparency and took advantage of it every moment I got. All in all, this internship experience was a once-in-a-lifetime opportunity and I’m so, so glad I chose to participate in it. It exceeded my expectations and helped me learn so much about myself and where I can see my future going, and for that, I am so grateful that I participated in STEP and learned about CPIP, because I really wouldn’t trade my time in Ottawa this summer for anything. It was, is and will remain irreplaceable. During this past summer, I had the amazing opportunity to work on Capitol Hill for U.S. 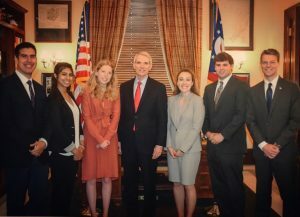 Senator Portman and his office. This internship was beyond anything I could’ve asked for, and the skills, experiences, and connections I gained throughout my time there are invaluable to my future. As an intern for the Senator, my daily tasks included answering phone calls from constituents, responding to constituent mail, and conducting tours of the Capitol for important visitors, as well as attending senate hearings on behalf of the staffers, writing up briefings and at times creating presentations on what was discussed during the hearing, and even helping staffers with current legislation work and research for an upcoming bill. My time on the Hill changed me in so many ways that I had never expected when I was applying for the position. Prior to this internship, I had never lived completely on my own, never had to figure out my own commute to work via public transportation on my own, never had a real job where I had to dress professionally before, and in all honesty, never expected to survive a whole summer working at our nation’s capital. I remember the first issue that arose for me was housing and at that point I realized it was going to be an uphill battle getting adjusted to the new life. I cried to my parents over how I’m somehow expected to find housing on my own, and they told me that I would figure it out. I remember they couldn’t book a flight to drop me off and that I was going to have to move in by myself in this foreign city. I remember no one was going to be around to teach me how to use the metro and I was so scared I would get lost and end up on the other side of the city. I remember worrying about if my fellow interns would like me at work so the 8-hour days would be bearable. Well as I passed one barrier after another and learned to become more independent, my confidence in my self built up more and more. I reached out to a ton of different resources and found roommates and an apartment on my own, I found a sorority sister who was able to pick me up from the airport and drop me off, I spent the day underground by myself figuring out the metro and basically discovered the entire city in one day, and lastly I made amazing friends and connections with my interns throughout my time on the Hill. All this made me realize how independent I can be and how much I had grown by having to be thrown into such an unknown situation. I am so proud of my ability to be on my own and figure everything out successfully without anyone’s help. I feel like prior to this internship, I was pretty reckless and expected people to just figure everything out for me, but after this experience I feel so adult like and ready to enter the work force. I remember a time when I was on the Hill I met an amazing man who I will never forget. I met him through one of my roommates and found out that we worked as a legal aid for Supreme Court Justice Gorsuch. When I told him I was interning at the Capitol, he was happy to meet with me so I could pick his brains and talk to him about his career. During our coffee meeting, he told me everything he had done in his life, including attending UChicago Law, working as a trial attorney representing clients like Kellogg, working under two different administrations, being a law professor at Georgetown law, and so much more, and I could not believe I was in the presence of someone so great. Immediately feeling under qualified to even talk to him, I didn’t want to waste his time talking about myself, but he was so interested in me and wanted to hear my entire game plan and all my goals for the future. He also would tell me when one of my plans was “stupid” and “pointless” which I really appreciated and helped me with accepting criticism and would give me solid advice that was sometimes hard to hear. This guy could’ve easily met quickly, but instead he spent over 2 hours with me. He is now someone I reach out to as my mentor constantly and has pushed me to question what I see myself doing, why I want to do what I want, and really motivated me to think about my future. Not to mention this connection got me the opportunity to meet with three U.S. Supreme Court Justices, and get private tours of the Court. Overall just this interaction is something I will cherish forever. Not many people have someone this successful and helpful and ready to push you, like this amazing human being, and if nothing else came out of this internship, at least I made a connection that will last a lifetime. This is just one of the major networks I built and I just had to go deep into detail with due to the massive benefits it produced for me. This made me feel like I was finally making real connections that would help me in the real world and I was actually becoming a young professional. Along with this network, there were many other key events and experiences that transformed me along the way. I met with CEO’s of companies based in Ohio, and got their business card just because I gave them a tour and they enjoyed me so much. This made me more motivated to reach higher and higher and become more successful like them as well as learn about all the new and exciting opportunities out their waiting for me. I would speak with constituents on a daily basis and hear their concerns, which transformed me into a more compassionate and patient person who wants to hear all sides of the story when legislating a bill that will affect everyone. Working alongside legislative staffers on current bills and hearing about valuable information before the general public would find out, made me realized that I actually do want to work on the Hill and in politics so I could stay in the loop constantly. And honestly just walking to work everyday all dressed up to the Capitol and seeing myself as a successful young professional woman, made me see that I want to work in this industry in the future. After this internship I see myself as a strong independent woman who can take on any adversity and flip it to benefit myself and make me so much more resilient. I ended this internship with a plethora of good memories, valuable connections and networks, and irreplaceable experiences, all of which was my own doing. I am confident in my ability to start completely over in a new city on my own and make it my home within a short time span. I know many expect the actual internship to be the transformational experience that STEP was intended for, however my time on my own in a new place, a new job, and with new people, is really what I am proud of. After college I see myself moving somewhere in the East Coast and while others may be scared to tread new waters, I am ready to take on new uncharted territories to expand my experiences in the future. This summer, I completed my STEP Signature Project by working as an intern with Community Legal Aid Services in Akron, Ohio. I worked directly with the organization’s Communications and Development department, which is in charge of marketing and fundraising for Community Legal Aid. At the outset of my internship, I was tasked with completing a special marketing project centered on the many ways that Community Legal Aid helps its clients. In order to do this, I scheduled interviews with clients all over Ohio, and spoke with them about their legal issues. I used these interviews to create promotional videos for Community Legal Aid. The goal of these videos was to allow the organization’s clients to tell their stories and to use the clients’ own words to illustrate the impact that Community Legal Aid Services has on the community. The most valuable aspect of this internship was that it allowed me to interact with people who had experienced poverty in a way that I never have before. I was raised in a wealthy community, and have never had to seriously worry about money. By contrast, Community Legal Aid serves the poor exclusively; the organization’s clients must meet certain income requirements in order to be eligible for the legal protections that the organization provides. As a result, this internship put me in contact with individuals who were severely disadvantaged, and who came from backgrounds that were very different from my own. This was a very valuable way to expand my worldview. Without Community Legal Aid’s representation, the clients that I interviewed this summer would have been thousands of dollars in debt, evicted from their homes, unable to access their health care. This was an important reminder about the gravity of the situations that some people live with. Without firsthand experience with these predicaments, it is difficult to understand how serious they are. Everyone has some sort of general idea about what it might be like to be poor. But, this internship put a face to poverty, and allowed me to see the real and difficult obstacles that impoverished people must face on a day-to-day basis. This was a humbling reminder of how lucky I have been in my personal life, and why empathy for those less fortunate than you is so important. The clients that I interacted with this summer were so grateful for the organization’s services, because they were facing life-changing obstacles and had nowhere else to turn for help. The other important lesson that my internship taught me was that individuals cannot always prevent themselves from falling on hard times through hard work alone. The clients that I interviewed were largely victims of external circumstances that took control of their lives and made them feel helpless. For example, I interviewed a man who had been diagnosed with emphysema after 32 years of being a firefighter-paramedic. Suddenly, after more than three decades of working in his profession, the man’s lungs were no longer able to sustain him during the strenuous physical activity that his job required. As a result, he was no longer able to work and no longer able to pay his bills. This man soon faced foreclosure on his home. Without the help of Community Legal Aid, homelessness was a very real possibility for this man. And none of this had come as a result of his own mistakes. His story, and many others, taught me that the predicaments that the less fortunate members of our society face are not always the result of their own shortcomings. The lessons that I learned from this internship will be important to me in the future as I pursue a career in law. Many law students enter the legal field with the goal of becoming a rich and powerful attorney at a large law firm. However, this internship reminded me that the goal of our legal system is to ensure an equal and just outcome for all, regardless of financial status. As a result, I now am certain that donating my time to the less fortunate by working on pro bono cases is a very valuable and necessary pursuit. Without the help of legal professionals who care about equality and about giving back to their communities, the clients that I met this summer would have been unable to stand up against injustice. Furthermore, this internship will be valuable to my future in the legal field because it changed the way that I see those who are involved in legal disputes. In my experience, the average person may view defendants with distrust, and believe that they are where they are as a result of their own wrongdoing. Although the idea that a US citizen should be viewed as being “innocent until proven guilty” is a pillar of our legal system, many Americans are predisposed to believe that individuals facing legal prosecution must have done something wrong or have something wrong with them. Surely, we think, these individuals must deserve to be where they are. However, the clients that I met this summer had ended up in the courtroom as a result of unfortunate circumstances, rather than as a result of character flaws. No one has absolute control over their circumstances. I learned a great deal about myself and about the legal profession through my involvement with Community Legal Aid Services, and am glad to have had the opportunity to participate in this internship. My STEP project was a Summer Global Internship in Santiago, Chile, which was completed through the Fisher College of Business. During my internship, I working for a start-up Accounting firm and completed multiple tasks, including bookkeeping, tax preparation, financial statement analysis, and more. During my STEP project, I was surrounded by people that didn’t speak the same language as me, had a different cultural background than me, and lived in a city that was much larger than the one I was from. At the beginning of my two months in Chile, I quickly realized that simple things that I took for granted, such as ordering food at a restaurant or asking for directions, were much more difficult when I had to speak in barely passable Spanish to people that didn’t understand English. However, most people that I met were very kind and understanding of the difficulties that I faced. Everywhere I went, people would notice that my accent wasn’t Chilean, and they would ask where I was from. When I told them I was American, I expected them to judge me or stereotype me. Instead, they asked many questions and wanted to learn more about my way of life in the US. One thing that I had been told a lot in the US is that people from other countries thought negatively of Americans, so when I went abroad, I unknowingly stereotyped myself. I was glad to find out that I was accepted in Chile, and it made my experience very rewarding. On the first day of my internship, I was greeted by a room full of happy Chilean accountants speaking rapidly in Spanish, which was overwhelming to say the least. It was very difficult to understand them, and I struggled to greet them all and respond to their questions. However, in the following days, I could understand more and more of their speech. The most difficult aspect of adjusting to their language and culture was learning business Spanish to supplement the basic Spanish I had learned in my classes. I frequently had to use a translator for words that I couldn’t remember. When we all ate lunch together during our break, we would talk about topics outside of our work, and that was when I really was able to practice my conversational Spanish and improve my abilities. I also learned about the culture and the language at a table tennis club that I trained at while in Santiago. The people at the club used a lot of slang, and many of the players were near my age and tried to teach me how to speak Chilean Spanish. They asked many questions about the United States, and were very eager to talk to me, especially to practice the little English that they knew. The table tennis club was a second home for me, I made friends there and learned aspects of Spanish that aren’t taught in any classroom. Additionally, I had to learn new vocabulary for table tennis too. I had never been taught words like “forehand” or “block” in Spanish, so I was starting from scratch. Thankfully, they were patient with me and were more than happy to teach me, and I learned a lot from them. Finally, I learned the most from the friends that I made in Santiago. One night at the table tennis club, I met someone who was a year younger than me and was very passionate about learning English. He immediately added me on Facebook and WhatsApp and we spoke to each other in English and Spanish every day and spent a lot of time together. He invited me to his home for dinner one day, and I saw what the inside of a home in Chile looked like and how a Chilean family functions. While you can learn about a country’s cuisine by going to restaurants, it isn’t as rewarding as spending time with someone and enjoying a home-cooked meal. I also spent time with another friend I made from the table tennis club, he didn’t speak any English but whenever he saw me at the club, his face would light up and we would talk between games. During the summer after my junior year of high school, I went on a service trip to Guatemala and worked in an eyeglass clinic and tested patients’ vision. That was my first experience in a Spanish-speaking country, and from that point on, I had a dream; my dream was to live and work in a Spanish-speaking country. When I learned about Ohio State’s Summer Global Internship Program, I saw an opportunity to make my dream come true. During my internship, I was able to achieve my goal and advance my career by increasing my knowledge of the Spanish language and learning more about Accounting. At the end of my internship, I was given the option to return the next summer to work for the company, and if I wanted, to work for them in Chile full time once I graduated. The people that I met in Chile and the work and activities I did there have significantly enhanced my knowledge and abilities, and have prepared me to excel in my Spanish and Business classes at Ohio State. (1) My STEP signature project consisted of an 8-week internship at a long-term care, skilled nursing facility; otherwise known as a nursing home. I spent the first 3 weeks with the admissions director, learning the ins and outs of getting patients in the facility, the next 3 weeks I spent in the business office learning how the facility earns and collects their money. The final 2 weeks I spent with the administrator learning what the job encompasses. (2) This internship was my first time working in a professional, business/healthcare environment. I gained many valuable lessons that will influence my decisions later in my career. I have also gained a greater understanding of my major. I realized that a long-term care facility was far more complex than I had originally assumed it to be. Sitting in with the individuals that worked in the facility, I realized that they had to work together with not only the people they worked with and those inside the building but also, their corporate company, county officials, insurance companies, and other outside health care providers and suppliers. As I spent more time in their offices, my biggest transformation was that I gained a greater understanding of how to communicate effectively. I had to communicate with others beside who I worked with, that were outside of the facility, whether it was through telephone, fax, email, or face to face. I would also have to interact with the residents in the facility. Each interaction was different and I learned to adapt to the situation. (3) Since I began my internship with the admissions director who also was the facilities social worker, I quickly realized that I would be interacting with residents and potential future residents quite often. An admissions director is responsible for obtaining the insurance information for potential future residents. As part of my role as an intern I would often have to contact these people or their families or the insurance company or Medicare/Medicaid to verify the personâ€™s coverage. As part of the insurance aspect I would also have to obtain signatures from the resident themselves or their power of attorney. I quickly realized and as a result learned that I would have to be able to explain to the resident, in terms they would understand or in ways in which they could hear me what I was obtaining their signature for. The next part of my internship was in the business office. One of the business officeâ€™s tasks is to manage some of the residentâ€™s money in a resident trust account. As part of this tasks I would have to explain to the residents that they could have money at the facility and answer and questions they had about it. I would often have to contact the bank or the social security office as part of handling resident trusts. Once a week I would code invoices that were to be sent to the corporate company. At the end of the month I would work alongside the business office manager to reconcile the accounts. The final part of my internship was spent with the administrator, since healthcare administration is what I plan on doing after graduation. The administrator has to be in contact with many people all throughout the day. I went outside of the facility with the administrator and marketer a few times to local hospitals and even a few churches in hopes that these efforts would bring future residents to the facility. I was also able to observe a mock survey, in which the corporate company would come in and help prepare the facility for state inspections. The administrator also went through many of the regulations that are required of a facility, and every day I updated the labor tracker. (4) I believe this transformation will be greatly beneficial to me in the future because I still plan on pursuing the career of healthcare administration. As an administrator in any environment, I know I will have to be able to communicate effectively with many people in order to do my job. All in all, I believe what I have learned in this internship was valuable hands on experience that will benefit me in the future whether that will be everyday interactions, in a job interview or in my future job. 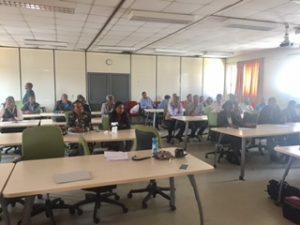 I traveled to Addis Ababa, Ethiopia with a few Veterinarians and Veterinary students from OSU who were going to Ethiopia to participate in the annual Rabies Mass Vaccination. My role was different than the others because I did not have a Veterinary background so my contribution to the campaign was mainly through my proficiency in Amharic. I translated many poster materials, survey questions and documents that needed to be translated into either English or Amharic. During the campaign, we walked door-to-door in two large sub-cities in Addis and vaccinated domestic and street dogs. I was also responsible for asking the prepared survey questions to gauge the effectiveness of the poster messages and images and to make the necessary changes. When I initially began the process of applying for this internship, I was both excited and nervous at the same time. 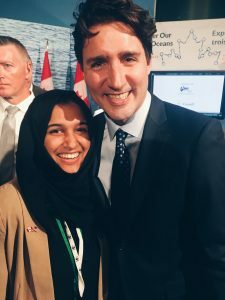 I was excited because I would be going to my country of birth and nervous because I am a Political Science student and this would be like nothing I have ever done before. I also had a fear of dogs that has developed in my childhood so I did not know how helpful I would be when it comes to vaccinating dogs. However, once we began the campaign I began to see that even though my background differed from everyone else, I was still able to contribute. We were using the materials that I translated and I was also responsible for interpreting during our daily work. I also realized that my Political Science experience was actually related to the work that we were doing. We faced some challenges in retrieving vaccinations and getting governmental support, which made me realize that different fields of work like Veterinary and Political Science worked together. In addition, my fear of dogs eventually faded as I began to understand the behaviors of dogs and the proper ways of handling them. Another valuable revelation that I had was how much change a small group of people could bring. Ethiopia is one of the countries that struggles with eradicating rabies and part of the problem is because there aren’t programs in place that specifically target this problem. Nevertheless, with less than 10 sent from OSU and the Global One Health Initiative along with a few veterinarians in Addis Ababa, we were able to vaccinate thousands of dogs and free two large subsidies of rabies. All this work was done by a small group of people that dedicated less than one month to the campaign. If this much change could happen in such a short amount of time, then I can only imagine what we can accomplish when different forces join and dedicate time to other causes. My experience in this internship also helped me internalize the value of some key traits such as patience, dedication, and flexibility. The rabies campaign faced many unanticipated challenges from not having enough vaccinations to poor road conditions and weather conditions. However, it required patience from all of us to be able to accept the challenge and fin different ways of approaching the job. It also required dedication because we could have easily given up working when it rained but instead we changed our schedule times and worked around the rainy weather. I understood that being able to be flexible in situations like this is important. Otherwise, our goals would not have been accomplished if we remained strict to our original plans. We had to be open to adjusting a few things in order to still achieve our main goal of vaccinating dogs. I can truly say that my experience working on the Rabies Campaign in Addis Ababa was transformational. I developed as an individual, as a student and as a professional. I am grateful for the exposure to a different field than my own and the chance to make a difference in my country of birth. I have also been changed by the dedication I saw in the Veterinarians I worked with and shaped by their personal experiences and advice. 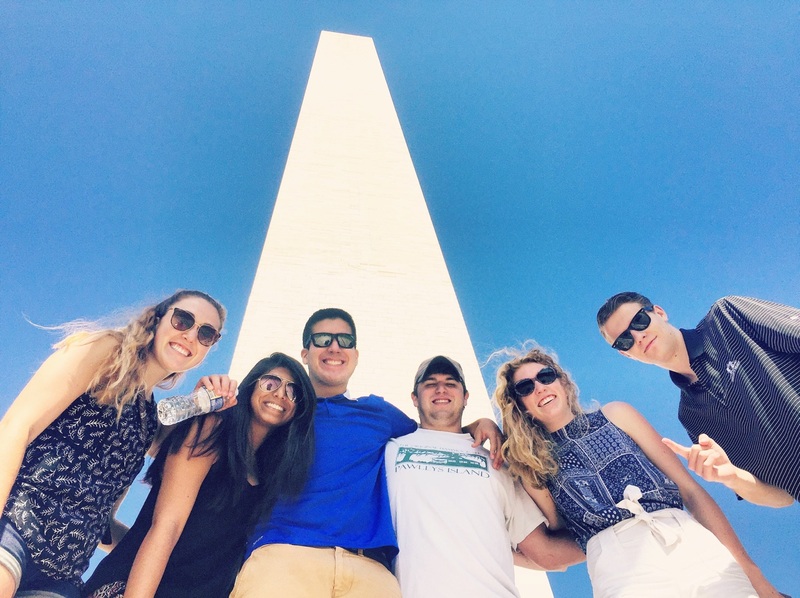 I have never traveled abroad for an academic purpose so this experience was definitely eye-opening and raised my interest in finding other study-abroad and internship programs both domestically and abroad. I am very glad I enjoyed STEP and got the opportunity to travel to Ethiopia and make a difference. Through STEP, I participated in an eight-week marketing internship provided by the Fisher College of Business in Singapore’s central city district. 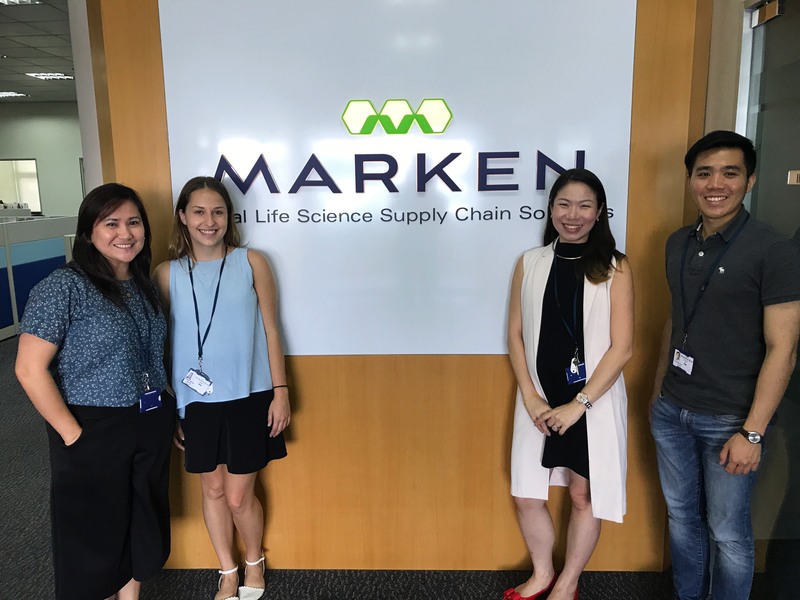 I worked at Marken, a pharmaceutical company for clinical trial logistics, and focused on tasks tailored to increasing branding and awareness of Marken in the marketplace. I coordinated with various team members across the Asia-Pacific region, enhanced the social media platforms, and transformed branch success stories across Asia into Marken case studies for publication. While being in Singapore, I developed a deeper understanding of myself and my global mindset. Before my internship and living experience in Singapore, I had never solely been on my own more than a couple weeks and it was my first full time internship. While I viewed myself as an independent, outgoing, self-starter type of girl in the comfort of Columbus, I questioned how true that was leading up to my departure overseas. Over the course of the summer, my initial assumptions about myself and work experience exceeded my expectations. By the time my internship concluded, I realized that I gained confidence, improved my work ethic, and appreciated my independence. There are so many events that took place while living and interning in Singapore that led to my self-transformation. To start, my confidence grew through my work environment. Like any other intern starting on their first day, I was quite nervous to meet my boss and coworkers and receiving my first projects I would be working on over the course of the summer. However, my nerves eased as I met my supervisor and boss that were more than thrilled to have me joining their team. By the end of the day, I was excited to start on the projects they had prepared for me. The following weeks, I was able to take initiative and really develop my own operating procedures and events for the company. The fact that my boss trusted in me to coordinate across the Asia-Pacific region to transform their social media platforms, start new advertising campaigns, and plan a philanthropy event boosted my confidence and faith in myself. Expanding on my internship, my work ethic transformed by working in a global setting. I had developed a strong work ethic at OSU working in the Office of Global Business, providing marketing and program management assistance for directors and interacting with students. I had to maintain a level of professionalism, reliability, and accountability. While I carried that work ethic with me in Singapore, I learned that a culturally diverse work environment requires a different kind of work ethic. I had coworkers from Malaysia, the Philippines, China, and the UK, each culture different than the other. I learned that I had to adjust my work style to fit with the multi-cultural and multi-locational teams I was working with. Instead of always putting business first, I built relationships with my coworkers and supervisor by happily joining them to eat local and share about myself all while presenting myself respectfully. It is one thing to learn in a textbook that working with diverse cultures requires a change in work habits, but actually experiencing it and making that change is crucial to successfully working abroad. After being back in the states, I really appreciate the independence I had while in Singapore. Not only the physical independence I had being away from my parents or close friends, but the independence I had to freely engage and learn about myself and the world. Most evenings or weekends, there was a group of us that regularly made plans to different destinations, sometimes hitting the top touristy places or eating in local hawker centers and experiencing local culture. However, there was one weekend that I was alone to do whatever I pleased. I took the chance to truly see Singapore and the local areas. I had an open mindset to whatever came my way that day. I explored Chinatown, Little India, and all the local shopping. I dined with a few of the OSU international students, eating at a hotpot that had stomach, liver, and all sorts of unknowns to me. While that weekend came and went, it was very important to me because I had the freedom to explore so many different cultures on the island and there was nothing that seemed to stand in my way of doing so. My time interning in Singapore was immensely important to the development of my personal and professional goals. I gained such an eye opening experiencing being placed in a country that is home to so many diverse cultures, and yet I still felt a sense of belonging. My confidence grew knowing that no matter where I travel or work in the world, I will be able to adapt and emerge myself into the culture to succeed both personally and professionally. I will continue my travels abroad and hopefully one day obtain my goal of working internationally, using this experience as a stepping stone to get there. I did an internship in Sydney, Australia for 8 weeks through Fisher College of Business. I worked at BIS Oxford Economics where I did research and analysis during the week and traveling around the Australia and New Zealand on weekends. I learned a lot about myself while being in Sydney, Australia. I believed I would struggle working in a company abroad. I thought I was going to struggle adapting to a different culture and the work environment. At work, everyone was nice. My co-workers took interest in my life and work that helped me make connections like I would do in the States. They made my livings easier in Australia and I gained lot of confidence in adapting to a new place. I have experienced more of the world by traveling around Australia and New Zealand. I was also really surprised how people in both countries knew about U.S’s culture and current events. Not only they cared about Australia and New Zealand, they also had interest in other countries as well. Before doing this internship at BIS Oxford Economies, I never really had work experience. I was nervous on first day with no prior experience working in an office. My co-workers helped me get through and helped me whenever I needed help. The project I did help me learn more about Australian Economics. They help me understand every little detail that I had done during my internship. I learned many things in this internship that will help me in future. I learned lot about Australian and New Zealand cultures from my co-workers. They would tell me things that I would not know. Surprisingly, they also knew more about American politics more than I knew about Australian politics. They knew what was going on around the world than many Americans do. After Australia and New Zealand being a successful trip, I have decided to travel around every year. My goal is to go to a new country every year, even after I get a full-time job. I went New Zealand and Brisbane, Australia by myself and made both of them a successful trip. I had planned both trips and that has inspired me to travel around the world, even if it is just by myself. Having worked in a different country, I have really gained confidence for my future. My future will require me to travel all around places. Personally, I now feel confident enough to travel anywhere alone. This will help me build relationships with clients as well as learning a new culture. At work, I learned my strengths and weaknesses and I will be looking to improving my weaknesses at my next internship. Not many people can say that they were able to do an internship in another country across the world for eight weeks. 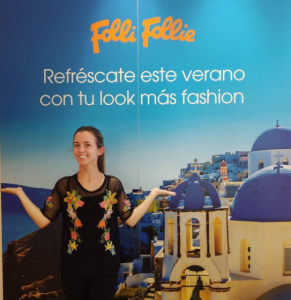 During the Summer of 2017 I interned in Madrid, Spain with the fashion company called Folli Follie. I had never been outside of America before this summer so it is easy to say this summer was monumental. 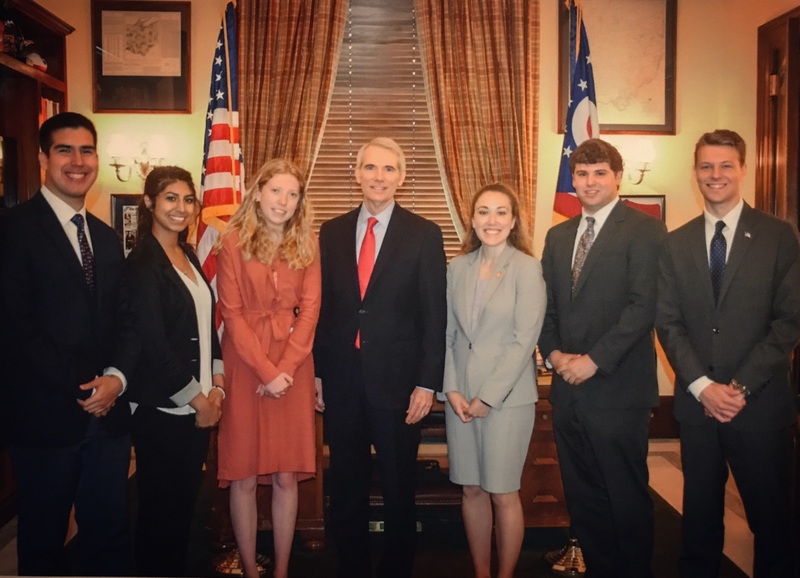 I am an international business student at Ohio State so I have always been curious what it would be like to work in a different atmosphere from Ohio. Because of STEP I was able to answer my question. I had taken basic Spanish courses, but I was by no means fluent. Emerging myself into the Spanish culture was difficult at first. I got lost navigating, I had to use Google translate a lot, and I had to adapt to the late eating habits. I wouldn’t change my decision for the world. STEP has only increased my passion for culture, and I hope to live in Europe again. I have a dream of volunteering with The Peace Corps after I graduate, but I was always nervous about leaving The United States. Now, I know I can do it. The biggest event I experienced was being alone and lost in Paris. I took a weekend trip with a group of students from my program. Because of flight complications, my flight was delayed and landed in a separate French airport from my travel mates. It was 3 in the morning when I landed, and I didn’t know a lick of French. I remained calm, and was able to navigate to my hostel. When I finally made it to the location I felt so accomplished. People from all over the world were willing to help me which warmed my heart. I have some lifelong friends because of this program. One of the most significant people I met was my friend Carlos. He was a Spanish student that lived in the dorm. He was incredibly enthusiastic and showed me and a few other students all around Madrid. He inspired me to always welcome people with open arms. He was excited about my culture and I was excited about his. We exchanged information and we hope to see each other again one day. I met people from all over the world while I was in Madrid. I made a lot of connections that I hope to keep. Working in Spain was incredible. They have an entirely different system. There are a lot more coffee breaks which is perfect. However, the best part about working in Madrid was how much my coworkers cared about one another. I have never seen such ingenuity before, and I hope to always care about people in such a sincere way. We always have cakes to celebrate each other’s accomplishments. I would help my coworkers with English, and they would help me with Spanish. It was a fantastic exchange. Personally, I now feel confident enough to travel anywhere alone. I did not feel comfortable before this experience. Academically, I feel ahead of my peers. I have international experience going into my junior year. Professionally, I feel comfortable using Excel in both English and Spanish. I feel ready to take on an international role in my future.